I wonder what Betty Crocker would suggest for 2011 mom. Maybe something like….Pretend that you’re dining in a 5 star restaurant as you wipe away the grease from the bucket of chicken you just brought home for your bratty children and ignorant husband. Ah . . . I like to think that Betty Crocker is still whipping up culinary delights from that big kitchen in the sky. On the bright side, driven-crazy 1956 mom would probably have a delightful smile, perfect hair and a perfectly ironed dress as she stabbed anyone 72 times for suggesting that was how she spent her day. Seriously, did anyone besides Donna Reed live like that? Ha ha! Yes, things were pretty rigid back then. I remember I couldn’t play outside on Sundays because it was a day of rest. I still don’t like Sundays very much to this day. There must have been a lot of stabbing going on behind closed doors. Neat stabs with straight, even lines, that is! And remember ladies, when stabbing, be sure to wear that fabulous red print dress. Not only will you look spectacular, but the colors and pattern will easily hide any unsightly splatter until you get to do the laundry again! Ok enough of me you are so good at making it funny – I actually envisioned for a quick minute – I bet you would be a nose thumber back then too – and I saw that you used this weeks word – with aplomb I might add – Too cool you ROCK! Proving….. 🙄 .yeah I am at a loss right now too. I was a hot mess as a kid. Not much has changed – I have always been the one whose hair doesn’t behave right forget knee socks I didn’t have matching socks. ack. I’ll let you know if I come up with anythng. My aunt and I compared our Betty Crocker children’s cookbooks over Xmas (I have both at my house). Hers is from 1962 and mine is from 1989. Anyway, while mine had more or less full recipes to follow, her book wasn’t so complete. Her spaghetti recipe was “a box of noodles and a can of red sauce.” And the macaroni and cheese recipe was “a box of macaroni and cheese and a can of Vienna sausages.” Yum. I love collecting old cookbooks. 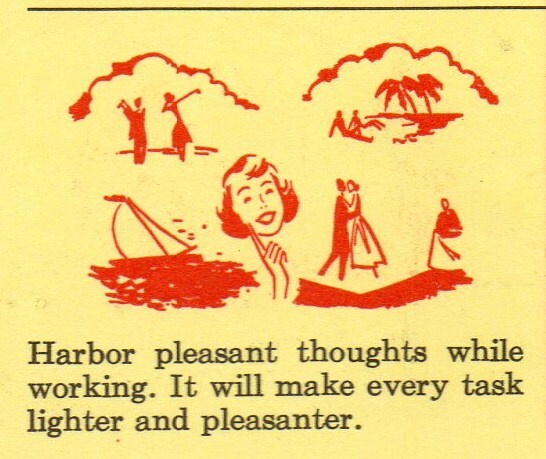 The ones in the 30’s are really interesting and everything is even more wholesome than the 50’s cookbooks if you can believe that. Why doesn’t my cookbook have these tips!? I might need to know it’s ok to lie down on the kitchen floor to get a grip on reality. It could be the little tidbit to bring up for interesting conversation with the fam later. Oh absolutely. Modern day cookbooks are screwing over modern day woman everywhere! My mom needs to get this cookbook. The only thing she relates at the dinner table are stories from her work, and she’s a lactation consultant. I wish she would find more kittens in trees. Or a new puppy. I bet she tells some funny stories though. If she could just find a puppy in a tree, she’d have something to talk about for years! 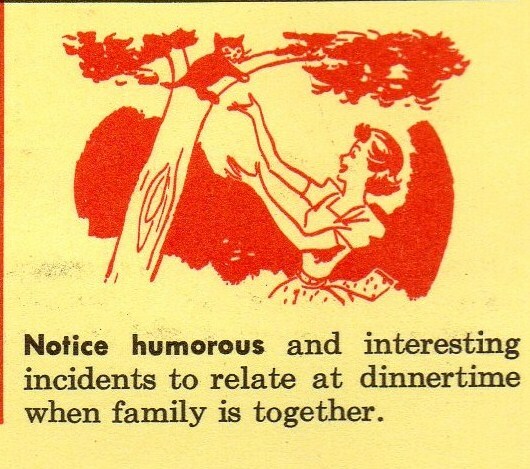 I love that it’s acknowledged that moms get tired,but I take issue with a cat in a tree being interesting. The happy thoughts are certainly taken care of with all the anti-depressants mommy needs to be on. Oh and don’t forget the Salem cigarettes! 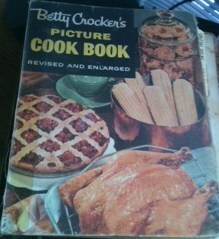 I grew up with a 1950’s edition of Betty Crocker’s Picture Cook Book. It was used so much we could no longer read the recipes on some of the pages, especially the ones for cookies.yuuummmy. Anyway… I recently found one at a used book store in excellent condition and I grabbed that puppy for only $1.50. What a find. What a deal. I hardly ever (never) cook, but IF I did I’d use this sucker all the time. I love how they show you how to cut tomatoes, peel potatoes and grate cheese. Who knew? I know! I love the old cookbooks. They remind me of simplier days, back when my mom was responsible for doing all the cooking and all I had to do was come in from playing outside and sit down to a big hearty, dinner cooked every single night of the week! My mother made fantastic homemade cinnamon rolls and chocolate chip cookies to die for! And of course she only used the Betty Crocker Cookbook! And it seems to me that the raw fruits and veggies were jucier and more flavorful. 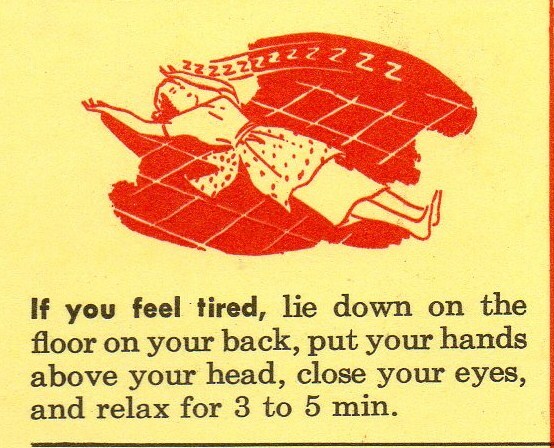 Ah the 50’s! Of course we did have to worry abit about exploding any moment from and atomic bomb. But hey the food was worth it! absolutely marvelous… I went and tried the laying down for five minutes, I got more tired, so it is time for a nap now (grin) I love the way this was written. (~_~) I like the way you look at life. Pierce! Thank you for stopping by. I will now buzz over to yoursm Toe Nail Fungus Schlep. I like it already!